Like most online betting platforms, Betsafe developed a mobile application that is supported by Android. The Betsafe Mobile App enables you to place your bets, compare statistics and get updated on the latest games and sports wherever you are. The only downside is you have to have a stable internet connection. Navigating the app is simple, and you can get to the sporting event you want with just a few clicks of the side menus. Furthermore, there are quick link buttons to the ‘Starting Soon’ matches so you can be updated on upcoming sports and other events. Go to the Settings of your android device. Go to the Betsafe Mobile Site using your preferred browser. A message will usually appear to ask if you would like to download the app. If it doesn’t, search for the ‘mobile’ tab located somewhere in the site’s footer. Download the APK file and it will install automatically. Run the app and bet away! iPhone and iPad users can also avail of the Betsafe Mobile App. It is more or less the same as its Android counterpart in terms of interface and features. It is also user-friendly and can be accessed in places with a stable Internet connection. However, there are iOS versions that can’t run the Betsafe Mobile App. A separate section will deal with compatibility issues and system requirements of the Betsafe mobile app. Betsafe Mobile App has a lot of features regarding sports betting. From the Betsafe Mobile App home screen, there is a cool top slider, which lists seven current in-play matches complete with the basic prices. You can easily navigate through more than thirty (30) sports categories, which will only take a few clicks to locate the sport or event you’re seeking. From there, it’s just a matter of scrolling down the betting markets to look at the best betting options. There are quick link buttons to the ‘Starting Soon’ matches, the ‘Live Video’ streaming service and ‘Top 25’. Starting Soon gives you an overview of upcoming games and sports. The Live Video feature lets you watch games, sports, and events in real time while the Top 25 feature lists the top 25 markets for the day with available features for live betting. The actual betting process is done in three easy steps. First, open your account. Second, make a deposit. Third, place your bet and confirm placement. It is straightforward indeed. The mobile site is a mobile browser version of Betsafe Mobile App. You can compare this with the desktop version of Betsafe since it is just recalibrated to be mobile user-friendly. However, the website for Betsafe on mobile devices is a little different from the Betsafe app android and the Betsafe app iPhone and iPad versions. The main difference between the mobile app and the mobile site version is how it is sourced and hosted. The Betsafe mobile website is not simply a responsive model of the full desktop version. It is an ‘m.’ not a ‘www.’ website. Hence, the site is formulated to adjust to your mobile device, be it an Android or an iOS. Other than that, the interface, the features, the look and feel of the Betsafe mobile site and mobile app are the same. Moreover, it provides the bonuses and offers just like when you are using your desktop with a less bulky and portable device. The Betsafe Mobile Casino boasts of popular online casino games with the same level and feels as an actual face-to-face casino. Popular Blackjack, Roulette and slot machines are top of the line. When we say the top of the line, it means that the hosting and testing are done by third-party contractors, namely, SKL (National Laboratory for Forensic Science in Sweden) and Technical Systems Testing in Canada. Poker is taken to a whole new level in Betsafe Mobile App since it has a separate gaming room known as Poker room. The Poker room is part of the Microgaming global platform which lets you bet with different players from around the world. It is an exciting way of interacting with people from different countries, even if it is just through betting. Installing the mobile app is not just to experience Betsafe on the go. It is also one way of earning a wide range of Betsafe bonuses, freebies, and prizes. If you join through the mobile app and create an account, a Welcome Bonus of up to 200 Free Spins can be given to you. It can be claimed after completing the registration process. It’s worth mentioning that this offer has no rollover requirement and all the winnings from your free spins will be paid cash. Although mobile punters can take advantage of this promotion, you should note, that the players who make their first deposits via Neteller, Skrill and Moneybookers will be excluded from the offer. Unfortunately, the sports welcome bonus is currently unavailable, but we must point out that Betsafe has a special bonus for all the poker fans. Even though the Betsafe Mobile App is compatible with both Android and iOS supported devices, there are limitations to its compatibility. This is not a technical issue. It just so happens that an older Android or iOS operating system does not have the capacity in memory and features to run and operate the Betsafe Mobile App. This section will tell you if your smartphone or mobile device can be used to download, install and run the Betsafe mobile app. Android versions 4.0 and above can cater to the mobile app. iOS versions 5 onwards are very much capable of running the mobile app. Nearly every payment method available is accepted by Betsafe. The table below shows the summary of payment methods and their required payment amount, be it deposit or withdrawal. Betsafe is an online casino that is also a betting platform, which caters to players around the globe. It offers a wide variety of sports and online events to cater to different types of customers. Some of these games are poker, horse racing, and tournaments. Betsafe offers live streaming of sports and events, and live betting as well. Live casino games are also available. The official site of Betsafe boasts of an interactive and user-friendly interface that is easily accessible by desktop, laptop, and even mobile devices. There are different types of Betsafe platforms for you to choose from. Betsafe Sportsbook offers good odds on local as well as international sports. The excitement is escalated because Betsafe offers a Live Betting feature where you can bet while seeing the game statistics in real time. Betsafe Casino, on the other hand, is more focused on online games such as roulette, slot machines, and blackjack. A separate interface is allotted for poker called Betsafe Poker room. Betsafe is part of the Microgaming global poker platform. Why can’t I download the Betsafe mobile app from my android device? You can enable the install from unknown sources security option in the settings of your phone for you to install the app successfully. How can I make my first deposit? After registering your account, you can make the deposit using Credit Card, Bank Transfer, E-Wallets, and Bank Link Transfer, then click deposit. Can I make deposits for other accounts, i.e. my friend’s account? No, You can only deposit in your account. Is there a fee for deposits? The Betsafe mobile app does not charge any fee for deposits. However, the payment mechanism may charge your transactions. Normally, it takes three banking days for the money to be credited in your account. Can I track my bonuses? Yes. You just need to go to ‘My Account’, and then tap on ‘Bonuses’. 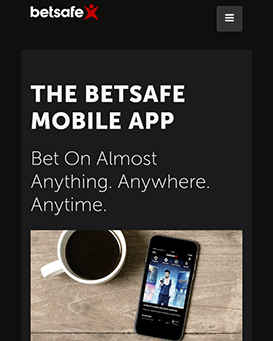 The Betsafe mobile app offers the required features of an online betting platform. It is also designed in such a way that players (both first time and regular players) are not intimidated by the design and interface. It has a lot of cool features and bonuses that will make you want to log in every day. Furthermore, the games in the online casino and sportsbook are tested by third-party contractors to ensure that you get the highest quality of games and experience. Betting and updating stats in real time is also included under the Live Betting feature of the app. However, as with all mobile apps, the regular updating and systems upgrade of Betsafe Mobile App can cause a delay in your mobile device. Furthermore, there is very little bonus and freebies offered as compared to other more established betting apps. Given the abovementioned summary, Betsafe Mobile App should be given a rating of 8 out of 10. How to install the .apk file?